ORLANDO, Fla., January 27, 2014 – In honor of its 35th anniversary, JESUS – the most watched film in history, having been viewed billions of times – has now been re-mastered in high-definition with a complete new musical score in Dolby 5.1 surround sound. Amid a wave of biblical theatrical movies releasing this spring, this classic film, re-titled The JESUS Film, will have select theatrical showings around the nation beginning in March. Additionally, partnering with Cinedigm and Mission Home Video, the high-definition film will be available on Blu-ray, DVD and digital format in retail and online stores nationwide April 1. The JESUS Film is a faithful depiction of Christ’s birth, ministry, death and resurrection as told in the biblical account from the Gospel of Luke. Virtually every word Jesus speaks in The JESUS Film is quoted from Scripture, with 450 leaders and scholars having reviewed the script for biblical accuracy. Further historical accuracy was ensured using clothing, pottery and other props made with first-century methods to portray a 2,000-year-old Palestinian culture. The JESUS Film has been officially recognized by The Guinness Book of World Records as the “Most Translated Film” in history, and is now is available in 1,197 languages. In addition, more than 200 million individuals worldwide have indicated a decision to follow Jesus after viewing The JESUS Film. This story of the film’s impact over the past 35 years will be shown through an exclusive new short feature narrated by actor Ernie Hudson and available on the re-mastered Blu-ray and DVD. Each disc will include The JESUS Film in a total of eight languages – English, Spanish, Mandarin, French, Vietnamese, German, Korean and Arabic. During the film’s restoration, each of its 173,000 frames were individually and painstakenly re-touched and re-colored, and new sound effects were added. The quality of the re-mastered, high-definition version of The JESUS Film is equal, if not greater, to other re-released classic films from similar eras, including The Ten Commandments. In addition to being made available in retail and online stores, The JESUS Film Project has joined Cinedigm and Mission Home Video with Tugg, Inc., to offer a minimum of 35 weekly theatrical viewings in honor of 35 years beginning in March. For only the cost of a ticket, any individual can choose to host a one-time showing in his or her local theater. 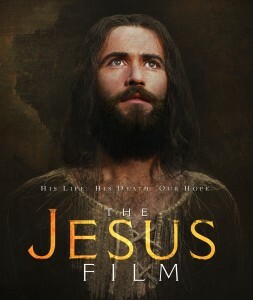 For information about The JESUS Film high-definition release and theatrical showings in available localities, visit http://www.JESUSFilmHD.com. The JESUS film was created by The JESUS Film Project, a ministry of Cru, following founder Bill Bright’s vision to take the message of Jesus to the world through video. Cinedigm is the leading independent content distributor in the United States, with direct relationships with over 60,000 physical and digital retailers, including Wal-Mart, Best Buy, Target, iTunes, Netflix and Amazon. The company’s library of over 32,000 titles and episodes encompasses award-winning documentaries from Docurama Films®, next-gen Indies from Flatiron Film Company®, acclaimed independent films and festival picks through partnerships with the Sundance Institute and Tribeca Films and a wide range of content from brand name suppliers, including National Geographic, Discovery, Scholastic, WWE, NFL, Shout Factory, Hallmark, Jim Henson and more. Cinedigm proudly distributes numerous Oscar®-nominated films, including The Invisible War, Hell And Back Again, Gasland, Waste Land and Paradise Lost 3: Purgatory; current and upcoming theatrical releases include Destin Daniel Cretton’s highly acclaimed Short Term 12, Godfrey Reggio’s Visitors, Penny Lane’s Our Nixon and Shaul Schwarz’s Narco Cultura. Mission Home Video, a subsidiary of Mission Pictures International (MPI), is a home entertainment distribution and marketing company that specializes in high-quality family and faith-based entertainment for mainstream audiences worldwide. Founded in 2008 by Cindy Bond and Chevonne O’Shaughnessy, MPI’s primary focus and commitment has been to firmly establish and maximize its trusted and vibrant brand of entertaining and life-affirming feature film and television programming throughout the global marketplace.